Periodically, Amazon RDS performs maintenance on Amazon RDS resources. Maintenance most often involves updates to the DB cluster's underlying hardware, underlying operating system (OS), or database engine version. Updates to the operating system most often occur for security issues and should be done as soon as possible. Some maintenance items require that Amazon RDS take your DB cluster offline for a short time. Maintenance items that require a resource to be offline include required operating system or database patching. Required patching is automatically scheduled only for patches that are related to security and instance reliability. Such patching occurs infrequently (typically once every few months) and seldom requires more than a fraction of your maintenance window. You can view whether a maintenance update is available for your DB cluster by using the RDS console, the AWS CLI, or the Amazon RDS API. 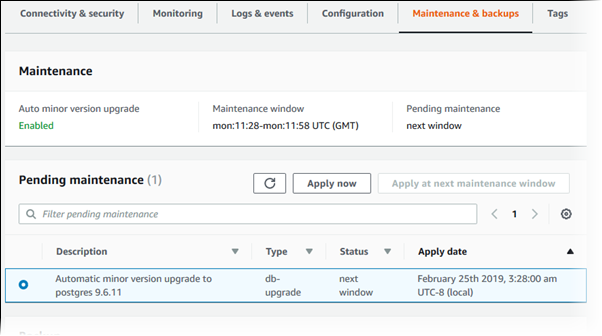 If an update is available, it is indicated in the Maintenance column for the DB cluster on the Amazon RDS console, as shown following. If no maintenance update is available for a DB cluster, the column value is none for it. To take an action, choose the DB cluster to show its details, then choose Maintenance & backups. The pending maintenance items appear. For information about updates to Amazon Aurora engines and instructions for upgrading and patching them, see Database Engine Updates for Amazon Aurora MySQL and Database Engine Updates for Amazon Aurora PostgreSQL . Choose the DB cluster that has a required update. To apply a pending update to a DB cluster, use the apply-pending-maintenance-action AWS CLI command. For example, the following example returns the pending maintenance actions for the sample-cluster1 and sample-cluster2 DB clusters. To apply an update to a DB cluster, call the Amazon RDS API ApplyPendingMaintenanceAction action. Every DB cluster has a weekly maintenance window during which any system changes are applied. You can think of the maintenance window as an opportunity to control when modifications and software patching occur, in the event either are requested or required. If a maintenance event is scheduled for a given week, it is initiated during the 30-minute maintenance window you identify. Most maintenance events also complete during the 30-minute maintenance window, although larger maintenance events may take more than 30 minutes to complete. The 30-minute maintenance window is selected at random from an 8-hour block of time per region. 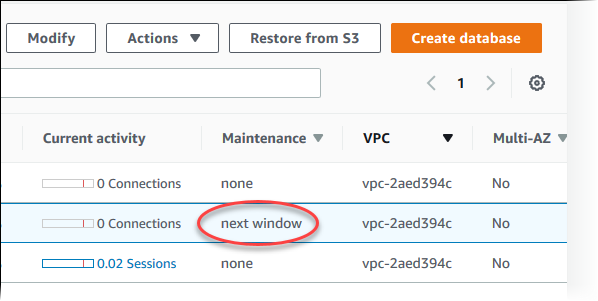 If you don't specify a preferred maintenance window when you create the DB cluster, then Amazon RDS assigns a 30-minute maintenance window on a randomly selected day of the week. RDS will consume some of the resources on your DB cluster while maintenance is being applied. You might observe a minimal effect on performance. For a DB instance, on rare occasions, a Multi-AZ failover might be required for a maintenance update to complete. The Aurora DB cluster maintenance window should fall at the time of lowest usage and thus might need modification from time to time. Your DB cluster is unavailable during this time only if the updates that are being applied require an outage. The outage is for the minimum amount of time required to make the necessary updates. Choose the DB cluster for which you want to change the maintenance window. For Actions, choose Modify cluster. To apply the changes to the maintenance window immediately, choose Apply immediately. Choose Modify cluster to save your changes. The following code example sets the maintenance window to Tuesdays from 4:00–4:30 AM UTC.